At this time of preparation, we remember the Christmas story from the very beginning. Who told Mary that she was going to have a baby? They were there to prepare them for the most amazing extra-ordinary event the conception and birth of God’s Son. At this time of preparation, we remember the Angel that delivered the message of God’s son to Mary and Joseph. At Christmas time more than at any other time of year we think about Angels, we have them as decorations, as the tree topper, we coo at the little ones dressed up as them in their nativity play. Angels are God’s messengers from heaven. They can look like ordinary people. They can be dressed in white, and shine. Sometimes you know you’ve been visited and at other times you don’t. All through the bible angels are mentioned in fact in the Old Testament they are called mal’akh in the New Testament that are referred to as angelos both have the same root meaning: ‘Messenger’. They are messengers from God, to people. To us. Simply they do what God wants them to do. They appear when people need help, when they need to be guided, when people need protection, they proclaim God’s word, they are guardians of God’s people. Angels are not people who have died. Angels have never lived but are spiritual beings that come from heaven. When people are in need and Angels appear sometimes the person or people they appear to do not even realise they are in the presence of Angels. In Hebrews 13:2 NIV it states: Do not forget to entertain strangers, for by so doing some people have entertained angels without knowing it. 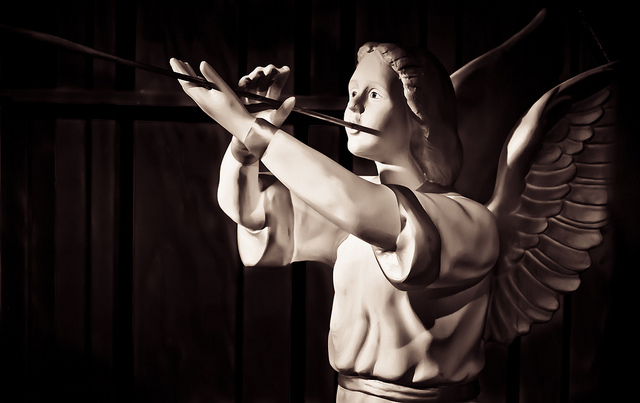 Angels are mentioned throughout the bible from Genesis to Revelation but we have to be careful that we don’t get distracted by the Angel itself and miss out on the message. This is why God often sends ordinary angels so that we don’t get distracted by the Glory of the Angel, but listen and hear the message that they bring. I wonder have you ever encountered an Angel? What message did they bring to You? When you have finished end with a prayer for all the times of sadness, for all the times of change, for all the times of joy and for all the people and Angels that surrounded you.